Experience Doktor Kaboom’s Crazy Fun Experiments! Doktor Kaboom is an over-the-top German physicist with a passion for science that knows no bounds. 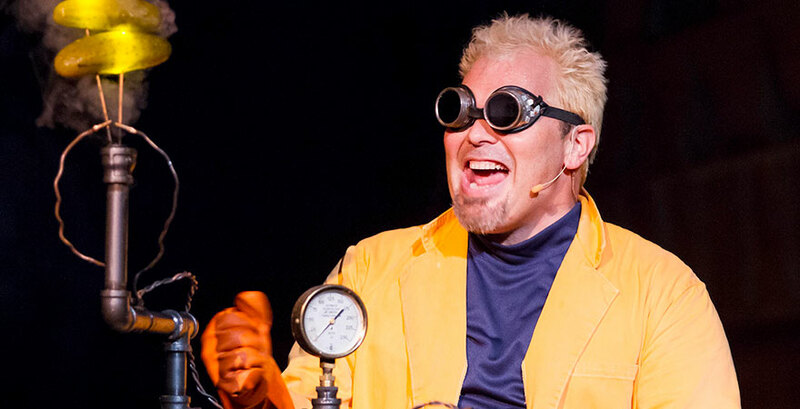 Sporting chrome goggles, an orange lab coat, motorcycle boots, and wicked cool hair, Doktor Kaboom travels the world, thrilling adults and children alike with an explosive comedic style. Through interactive character-driven science comedy, Kaboom works to improve society's understanding and retention of basic scientific principles, builds upon those basics, and demonstrates that all science is for everyone. Join Doktor Kaboom as he performs his crazy fun experiments on January 21, 2017 at 1pm and 4pm at The State! In Live Wire! The Electricity Tour, Doktor Kaboom goes on a riotous romp through the fundamental principles of electrical energy and the history of humanity’s adventures into its potential. He explores what electrical energy is, what it does for people, and where it comes from. Equipped with Tesla coils, Van de Graaf generators, and a ping-pong-ball-shooting robot, Doktor Kaboom explains everything from voltage, current, magnetic fields, conductors, plasma, and resistance to energy conservation and safety. His German accent is comically strong, and the audience happily complies with his request to yell back the German yes, “Ja,” after every demonstration. There’s lots of audience participation, a ton of laughs, and some serious science! With simple, yet eye-catching stage experiments he shows children the wonder and fun of science while also driving home the message of safety first. Doktor Kaboom explains the concept of static electricity—when electric charges build up in one place and don’t move. For example, a balloon has an overall negative charge, while hair has an overall positive charge. Since opposite charges attract one another, hair is attracted to the balloon. The electrical charges don’t move anywhere because hair and the balloon don’t conduct electricity very well. 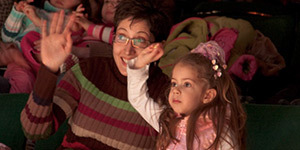 To demonstrate this, Doktor Kaboom performs an experiment where he rubs a balloon on an audience member’s hair, then moves the balloon away slightly to find that their hair stands on end (the experiment is also performed with Kaboom’s device that generates its own static electricity). In the show, Doktor Kaboom demonstrates a device that uses a flow of electric charge—called electric discharge—to make an ARC (or current) of plasma in the air to explain one of the four states of substances (solid, liquid, gas, plasma) as well. Always encouraging of audience participation, Doktor Kaboom explains how particles with positive and negative charge work by bringing two volunteers on stage and helping them put on “bubbles of safety” (large air bubbles forming a ball shape that go over their head to protect their body). The bubbled volunteers represent negatively charged particles and are unable to stick to each other when they collide. The volunteers do their best to get the Velcro to stick by running from either side of the stage into each other, but they bounce off each other anyway. They can only stick to Doktor Kaboom when he puts his “bubbles of safety” on and is a positively charged electron. Doktor Kaboom’s teaching methods are as fun and entertaining as they are educational for all ages. With Doktor Kaboom, no two shows are the same as he improvises and builds off audience interactions during every show. Favorite moments from past audience members include the science behind pickle light bulbs, air cannons, and homemade rockets! Embark on a scientific journey with mad scientist, Doktor Kaboom, on January 21, 2017 at the State Theatre New Jersey as he performs one crazy experiment after another!